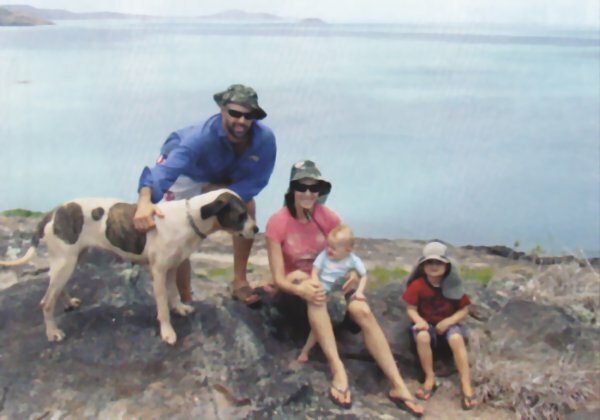 Bacon Busters Editor Clint Magro and family complete their North Australia Safari with a sensational couple of months on Cape York! OUR JOURNEY HAD come to a halt as my best mate phoned us to say he was getting married in two weeks. This was a complete shock as we'd have to miss Uluru and Alice Springs, not to mention Kunnanurra and the Kimberley in WA's north. It was a letdown and with a couple of months up our sleeve, we decided Cape York was to be our next destination. The roads out in Central Australia are as straight as a gun barrel and there's not too much about. The odd feral donkey and numerous camels kept the kids amused as the Hilux struggled along the Barkley Tablelands in fourth gear with caravan in tow. Passing through Mt Isa and a handful of remote western Queensland towns, we trekked east toward Cairns. 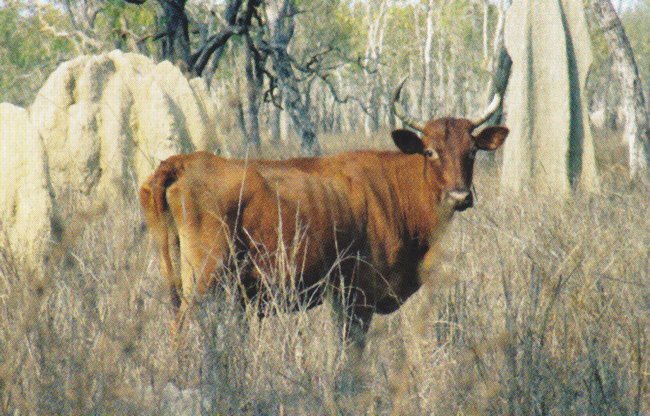 A few pigs and Chital deer were spotted feeding on the roadside near Charters Towers; there was always something interesting on our travels that caught our attention. 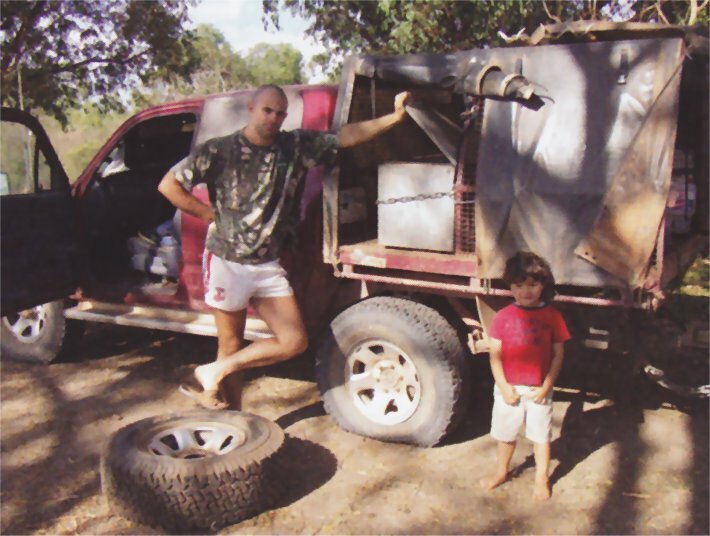 We settled in Cairns for two weeks before heading north to Strathburn Station for five days. 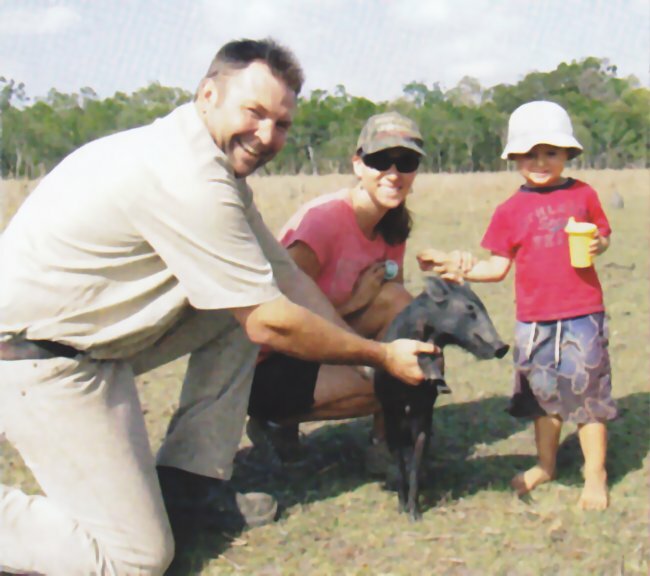 Alisdair Robertson manages the 600,000 acre block and runs guided pig hunts. Lucy had her first birthday here and we enjoyed the morning with a half melted ice cream cake. The kids loved the adventure and enjoyed the hunting when we made the time. They loved seeing Daddy stalking deer or a dingo, but pigs were the most thrilling for them. They love reading Bacon Busters and I teach them as much useful information on feral animals in Australia as my knowledge allows. Strathburn was a sanctuary to say the least! Pigs were in massive numbers wherever we drove and Alisdair knew the place very well, picking the most populated dams to show us. We strapped the kid's seats in the rear of the Troopcarrier and travelled off for the day in search of big boars. Wild scrub bulls charged through the scrub in front of us, while resident dingoes eyed us off and kept their distance. The bird life was amazing as was the scenery. 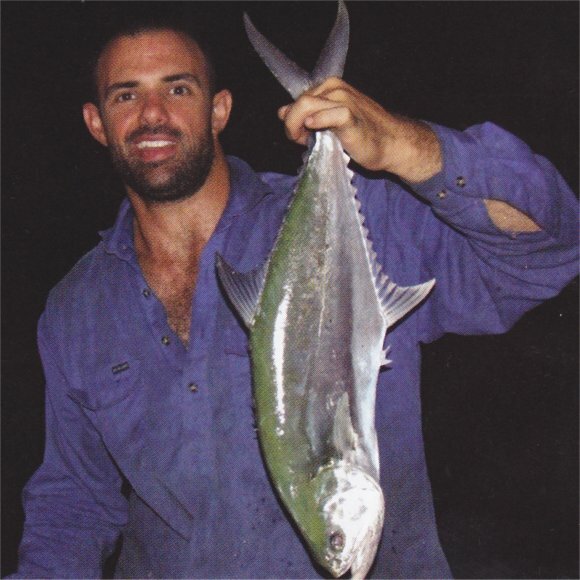 We pulled up at a huge billabong and Alisdair had a one kilometre walk planned. I put Bowen on my shoulders and carried Lucy, while Bec slung the Howa .30-06 over her shoulder and walked in front of us with our guide. You couldn't keep the kids quiet as they voiced their excitement seeing crocodiles, birds and some small goannas. I thought this might have blown our chances of spooking pigs, but I suddenly had everyone come to a halt. Thirty metres in front of us was a boar sleeping next to a log. His ivory stood out, so Bec crept to the nearest tree and set up for an easy shot. While the kids were anxiously awaiting a shot, the pig stood up to see who had woken him. Bec was still trying to steady the rifle and set the crosshairs on the feral and I had plugs in the kids' ears as we watched the scene unfold. The pig was now agitated and ready to burst off; but he yawned and just lay back down. Bec soon fired and the boar was hit. I offloaded the kids and swapped her for the rifle as the boar took off toward the water. I finished him fifty metres from where he lay as he folded from the Highland projectile. Smiles and interest were now evident on the kid's faces as Alisdair couldn't get them to look at the camera for a photo. They were too busy staring at the boar that lay next to me. Day in, day out, Alisdair drove us around from dam to dam checking for good boars. The weather was warm through the day and pigs relied on the freshwater to keep cool. Another top spot was encountered when we parked the truck 500 metres from a dam and walked to a vantage point where we could scope out the place. Pigs were in their dozens and walking everywhere. Most were in knee-deep water digging around for bulbs that were secluded beneath the muddy water. They had no idea of our presence, even though Bowen and Lucy were throwing sticks and laughing out loud. Alisdair and I looked through the binoculars trying to pick the tuskiest boar for Bec to shoot. After deciding that the closest one was the best, Bec fired and dropped him from 100 metres. She was slowly getting her eye in now! Before departing this huge waterway, Alisdair left some yabby pots as we planned to check them later on. We came upon another fine area when sixty to seventy pigs congregated on an open paddock. 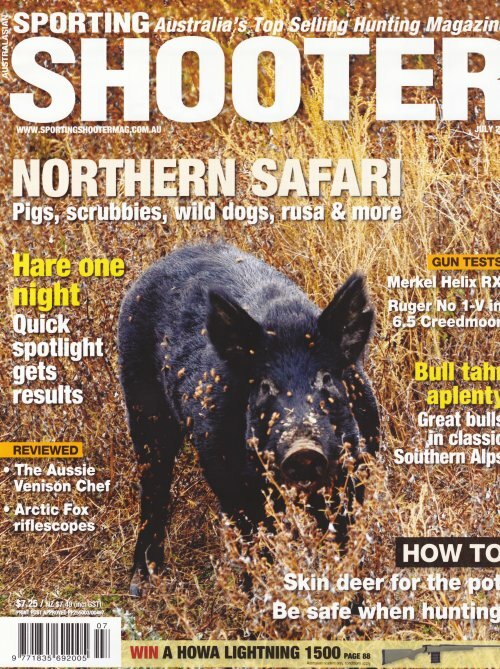 Two good boars fought over a sow that was on heat, before I disrupted the party with a shot from the .30-06. 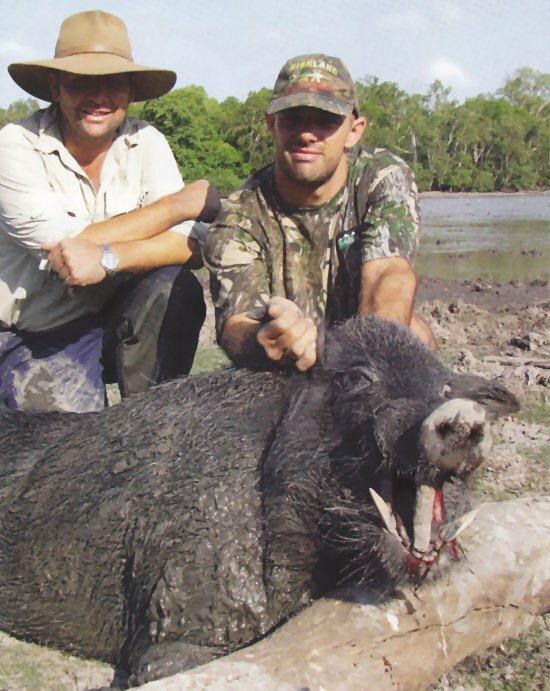 At 200 metres, the bullet went low and missed the boar in the background and hit the fertile sow. Disappointed with the shot and that I was out of bullets, I just had to watch the pigs scour around the paddock and feed till their hearts were content. Bec and I took it in turns stalking with Alisdair as one of us stayed at the truck and amused the kids. One such trek through some rubber vine saw Al and I arrive at a small dam and eight solid boars dug away in the water. I set up the video and got myself into position only 80 metres away from my target. I fired and the beast launched up in the air and took off for the tree line. I didn't even lift the rifle for another shot as I knew that bullet hit home. Charging through the water, he exhausted himself right in the middle of the dam. I was keen to see his teeth, so Al and I trudged straight into the dirty water and retrieved the beast. He was big, fat and was obviously eating a lot of good feed. Our time at Strathburn had come to an end and five full days was a great family adventure. 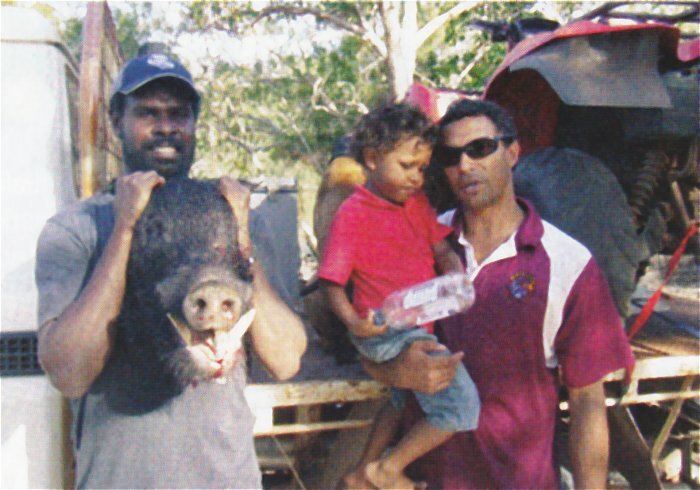 The pigs were in their hundreds and the scrub bulls, dingos, bird life and crocs were prolific. 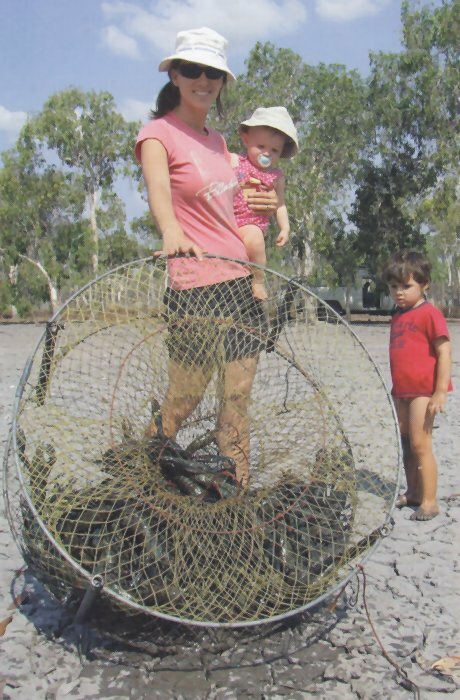 We even had a beautiful feed of freshwater yabbies. Alisdair was a fantastic host and looked after my young family extremely well. It was off to the tip of north Australia and the rough 550km from Musgrave was an exhausting drive. Numerous pigs were seen on the sides of the road as were dingos and good numbers of wild cattle. Loyalty Beach (which is situated at Seisia) was our destination and it was spectacular. We camped right on the beach and looked over the Torres Strait towards Horn and Prince of Wales Island. Settling into our new waterfront accommodation, I successfully fished for Nannygai and Barramundi in our relaxed surrounds. We had planned to be picked up by my Uncle Rusty, who was a pearl farmer and local resident in the area for the past twenty five years. We piled into the small fibreglass runabout and set off for three weeks on his nearby island. It was here that we relaxed at the Northern most tip of Australia. We helped my Uncle out with some much needed work on his newly constructed pier and then fished and chased pigs at any spare minute I had. I made a few trips back to the mainland and got amongst some big mangrove boars and small number of Molucan Rusa deer. 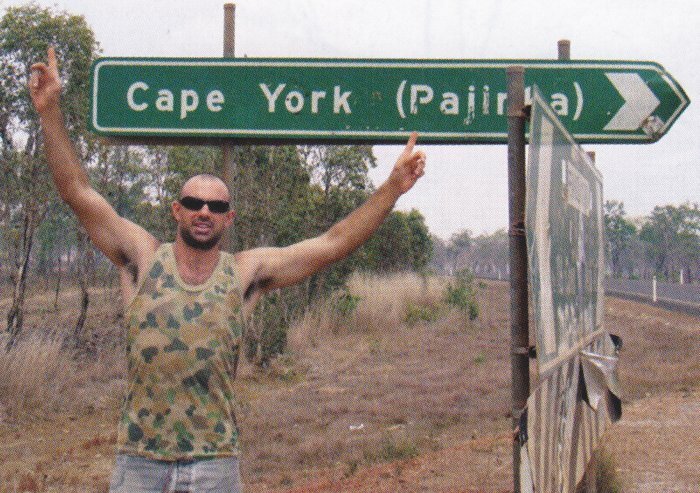 Leaving the top of Cape York was tough as it was such a beautiful place and has to be on everybody's To Do List. With such a diversity of people, rugged terrain and remote areas full of wild game; it really is a hunters paradise.